Methuen & Co, 1960. Hardback, ex-library, with usual stamps and markings, in fair all round condition suitable as a reading copy. Binding torn at the front. No dust jacket. MethuenWiley. Used - Good. Former Library book. Shows some signs of wear, and may have some markings on the inside. New York: Methuen. Good with no dust jacket; Used - Ex-Library with Markings. 1960. First Edition. Hardbound. 190 pages . Methuen & Co, 1960. This is an ex-library book and may have the usual library/used-book markings inside. .This book has hardback covers. In fair condition, suitable as a study copy. No dust jacket. MethuenWiley. Used - Good. Ships from the UK. Former Library book. Shows some signs of wear, and may have some markings on the inside. 100% Money Back Guarantee. Your purchase also supports literacy charities. MethuenWiley. Used - Acceptable. Ships from the UK. Shows definite wear, and perhaps considerable marking on inside. 100% Money Back Guarantee. Your purchase also supports literacy charities. London:: Methuen & Co.. Cloth. 12mo. 190 pp. Dj browned, price-clipped. 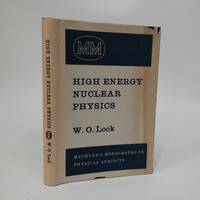 Deals with pion scattering by nucleons, the photoproduction of pions, pion production by nucleons, and nucleon-nucleon and nucleon-complex nucleus interactions in the energy region above 100 MeV. . Fine. 1960..
John Wiley & Sons. 1960. Hardcover. UsedVeryGood. Hardcover; light fading, light shelf wear to exterior; fading to pages; oth erwise in very good condition with clean text, firm binding. Dust jacket sh ows fading, light soiling, and edge tears. .